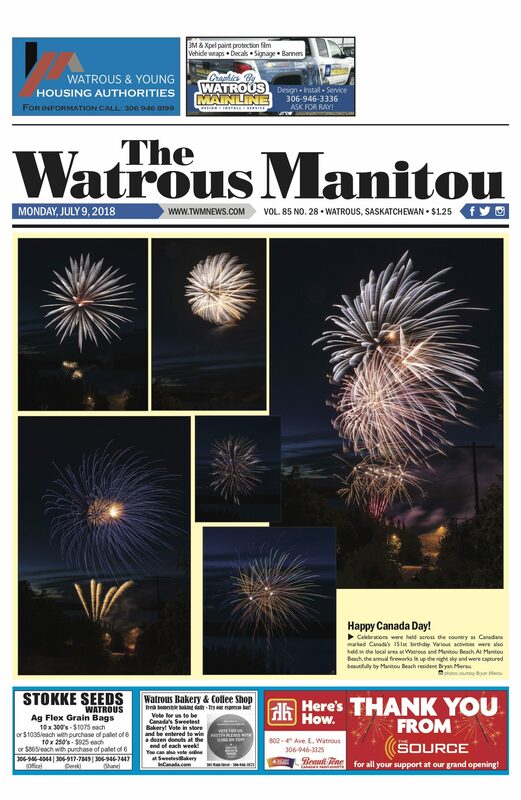 If you pack the Watrous Manitou in your suitcase, says owner Daniel Bushman, you’re guaranteed a spot in TWM Around the World section of the weekly paper. Beneath the Eiffel Tower, atop the Great Wall of China, in front of the Taj Mahal, people are reading the Watrous Manitou. 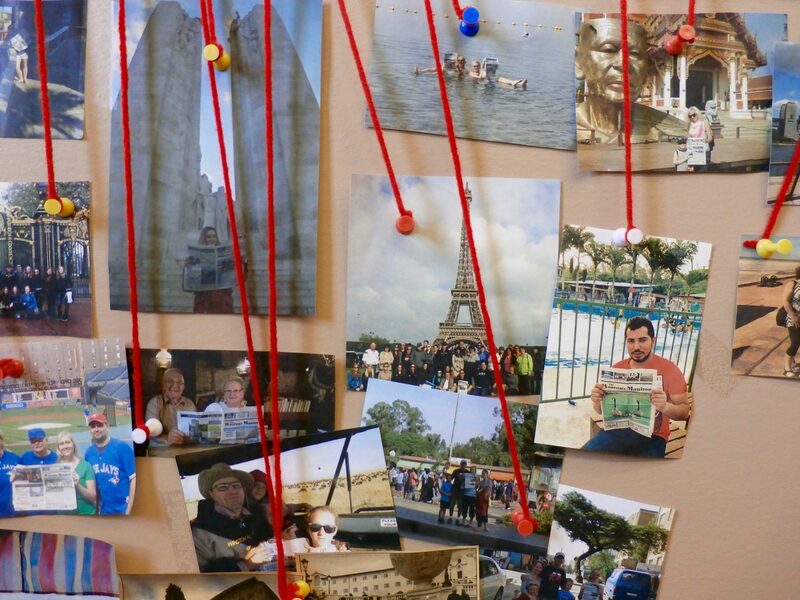 At the Main Street office in Watrous, Sask., pieces of red yarn connect dozens of photos of residents reading their 86-year-old local paper to points on a map of the world. Bushman flips to the back of the latest issue where a group of Winston High School students sits on the rocks beside Nistowiak Falls – the highest natural waterfalls in Saskatchewan – newspapers spread open. While reports about the dire state of the Canadian newspaper industry surface regularly, some critics point out that such reports might be missing the full picture when it comes to community newspapers. In a 2018 Toronto Star column, Torstar board of directors chair John Honderich lists 112 community papers that have closed in the past decade. Marc Edge, author of Greatly Exaggerated: The Myth of the Death of Newspapers, refutes these numbers in a blog post, pointing out that since 2011 the number of community papers throughout Canada have decreased by only 10 titles, from 1,042 to 1,032. While outlets have closed, says Edge, often the result of corporate swaps and cutbacks, others have opened. Alexandra Kitty, former community journalist and author of When Journalism Was a Thing, agrees, calling Honderich’s analysis “such a distortion of facts that it isn’t funny,” yet also says good riddance to the defunct local papers, filled with nothing but what she calls “happy, happy soft news junk.” Kitty is not alone in her critique. 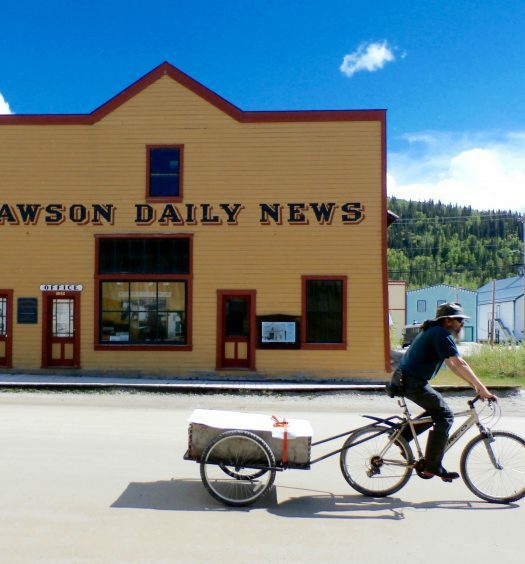 But while sometimes dismissed as fluff, or even “execrable fare” by people like Ian Gill, advisor to the CEO of the Discourse, in No News is Bad News: Canada’s Media Collapse – And What Comes Next – small town papers mean business. Literally. Hundreds of titles circulate to millions of readers, readers who often have no other source of local news. With advertising revenues of more than $873 million, according to a 2016 News Media Canada Revenue Survey, community newspapers can still provide the means to make a decent living, and a new generation of publishers, intent on producing quality journalism, are diving in. Eleven years ago, award-winning Mohawk journalist Steve Bonspiel dove in when he was 32, purchasing the Kahnawake-based Eastern Door. In May 2016, Carolyn Barber and Andrew Brooks abandoned their lives of academia at prestigious U.S. universities in their late 30s and bought the Cape Breton-based Victoria Standard. To save their paper from closure, a group of newspaper employees at Saskatchewan’s Prince Albert Daily Herald, spearheaded by 43-year old Donna Pfeil and 25-year old Peter Lozinski, purchased the 124-year-old paper in December 2017. In April 2018, 21-year old welder by trade Micah Waddell bought his grandfather’s century-old Rivers Banner in Manitoba. A generation that formed the bedrock of community-newspaper ownership in Canada, which during the course of this research was overwhelmingly over 60, male and white, is slowly being replaced. While, generally, information about newsroom diversity in Canada is hard to come by, U.S. Media Deserts Project and dean of the School of Journalism & Graphic Communication at Florida A&M University Michelle Ferrier warns it’s important not to replicate patterns of the past when it comes to local news. There was never a “golden age” of local journalism she said at a 2017 Local News Conference hosted by Ryerson University. We have a small window of opportunity, she said, to begin a new conversation. “We do a little bit old school and new school,” Bushman says, standing in front of one of the tall wooden layout tables arranged in a semicircle in the heart of the office. Unlike so many newspaper offices throughout the country, where such tables have been relegated to dusty back rooms or repurposed into bookshelves, or even firewood, Bushman and his team of three employees actually use them. He explains the process of cutting out ads and articles by hand, putting them through a waxer, and laying them out on each of the three tables. 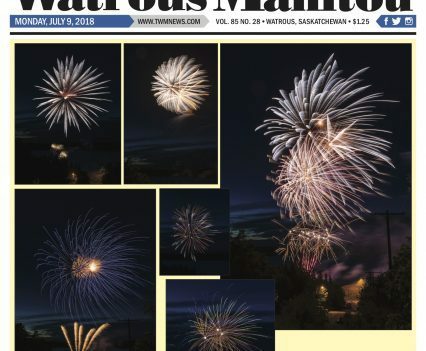 This week’s paper is still there, the front page covered with colourful bursts of light, the annual July 1st fireworks display held at nearby Manitou Beach, home of the Dead Sea of Canada, and Danceland, a “world famous” dance hall with a horse-hair floor built in 1928 where people like Elvis Presley and Al Capone are rumored to have visited. Bushman doesn’t mind the labour-intensive process of laying out the paper by hand. The results, he says, are worth it. “I want to make a paper the community can be proud of and get behind,” he says. Whatever Bushman is doing is working. 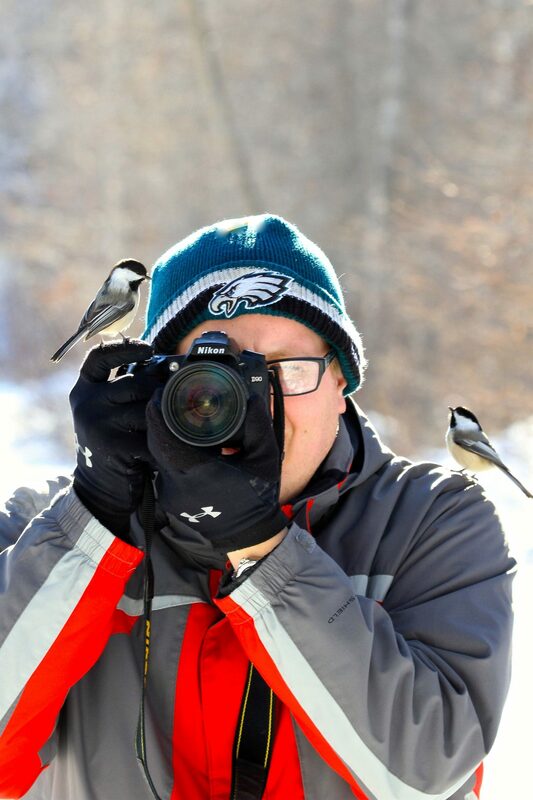 His articles and photos took home five awards at the 2018 Saskatchewan Weekly Newspapers Association Annual Awards, including first place for Best News Story of the Year. While circulation numbers decreased after buying the paper, now they’re “holding fairly steady,” says Bushman, with a current circulation of 1459, according to the Saskatchewan Weekly Newspapers Association. Bushman offers online subscriptions, with the “nugget,” he says, of getting the paper three days earlier. So far, only 160 are going for that nugget. “I don’t know why that is, it’s just the way it is,” says Bushman. 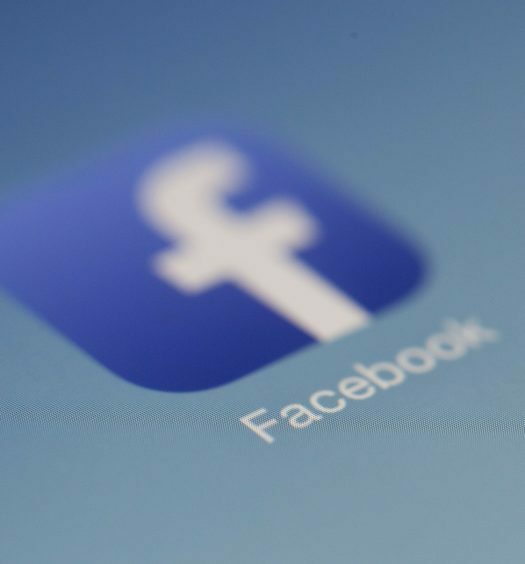 The paper’s Facebook page, however, has 2,223 followers as of March 2019, in a town with a population of 1,865. Breaking news, weather reports, wildlife photos, videos of fundraisers such as the “frozen tongue challenge” and Telemiracle Helping Hands (which both raised more than $16,000) can attract up to 200 “likes.” Locals – a barber, a Mainline Motor Products employee, an art gallery owner – comment to express their appreciation. “Would you like me to turn off the air conditioning?” Bushman asks, pointing to the black Philips recorder. “Maybe it will affect your recording.” But the cool office is a relief on this July afternoon in the prairies, where on the outskirts of town fields of ripening wheat, canola and flax shimmer in the heat. Bushman is familiar with recording devices. In 2002 he graduated from Winston High School and moved to Saskatoon to attend the Western Academy of Broadcasting and fulfill his dream of working in radio. After landing a job as a news sportscaster with a Saskatoon Media Group radio station, Bushman met his future wife. 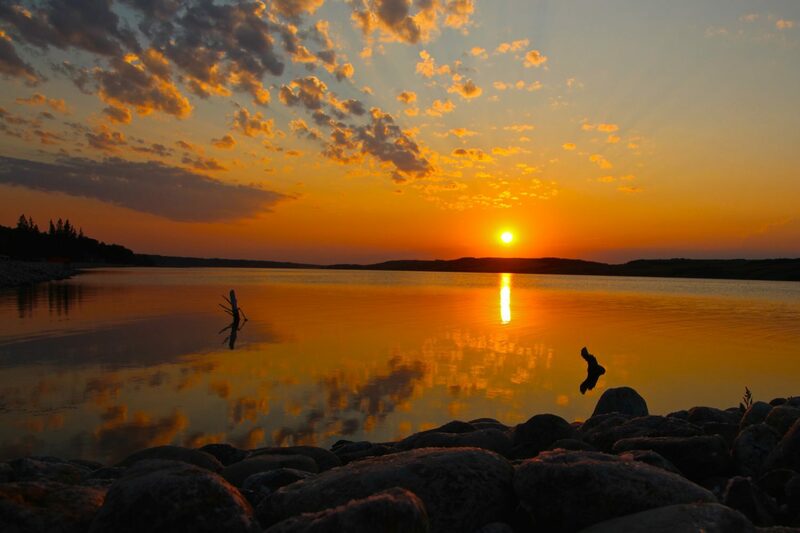 While deciding where to live, the couple, both from small towns, started to think about bucking the trend of interprovincial migration to provinces such as Alberta and Ontario and moving, instead, to Watrous. The lure of affordable housing, family and being part of tight-knit community beckoned. After applying for jobs at places like the local car dealership, Bushman’s father called, telling him about an ad in the Watrous Manitou. They were looking for a reporter. Bushman drove the 106 kilometres to Watrous for an interview. A few weeks later, he was learning how to transform 30-second radio-style stories – “a lede, an audio clip, and then you’re out,” he says – into newspaper-length articles. After five years, owners Robin and Nicole Lay asked if he and his wife Kim wanted to purchase the paper. The Lays wanted to continue the tradition of a “family-owned business,” says Bushman, which began in 1933 with James and Mildred McGowan. For Bushman, purchasing the paper meant he could “have the security” to continue doing what he enjoyed. Furthermore, the “entrepreneurial spirit” was something that ran in the family, he adds – his father owns the local hardware store, his grandparents owned a grocery store. “I was definitely like a deer in the headlights at the start,” says Bushman. In 2010, Emmy and Peabody Award-winning television correspondent and National Public Radio commentator Judy Muller set out to experience the geography of America’s small town papers firsthand. “I was just sick of people going, ‘oh, journalism is dying, journalism is dying’,” she said in a 2016 telephone interview. Muller’s journey resulted in Emus Loose in Egnar (the inspiration for this series and an upcoming book). 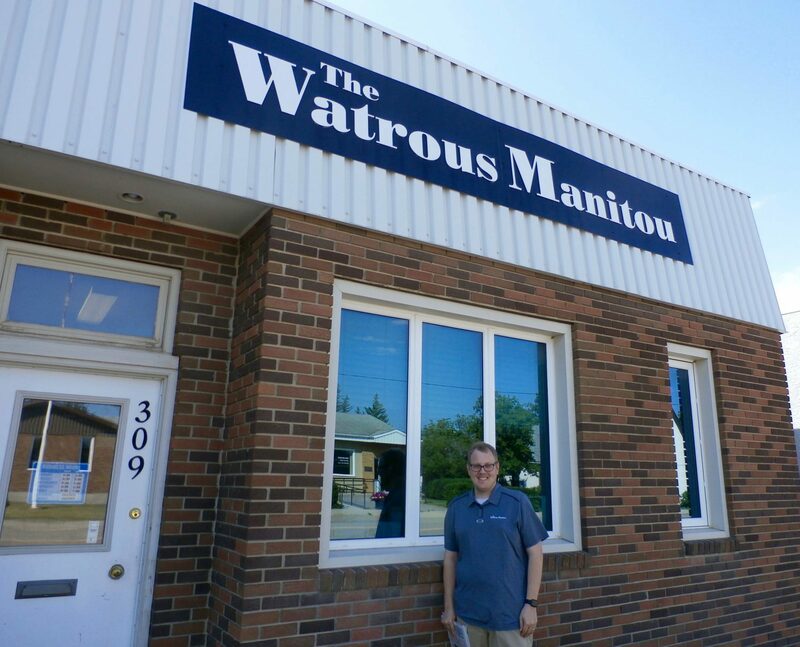 Bushman doesn’t use such terms to describe what he’s doing at the Watrous Manitou. Instead he talks about his grandparents, immigrants from Russia and Poland, who struggled so hard to make it in the prairies, and the influence of his parents, his mother a community nurse. He grew up working in his father’s store, learning about the values of hard work, integrity and supporting your community. The concept of giving back is simple, he says. The community supports the paper through subscriptions and advertising. In turn, Bushman supports them. The paper donates to local organizations, offers discounted advertising to important causes, writes promotional articles, gives away things, such as photos, for door prizes at fundraisers. He shops locally. If they buy a vehicle, they buy it from one of the three local dealerships. If they list their house, they list it with a local realtor. “If restaurants are advertising in our paper then I’m going to eat at those restaurants, right?” he says. This governing principle embraces a holistic and interdependent view of the community newspaper. “I never feel that it’s my paper. It’s the community’s paper. I just feel like I have the responsibility to convey what the community is doing,” he says. Such a responsibility can weigh heavily on Bushman at times, when the news isn’t so rosy. He talks about murders, car accidents and trials, sharing details he would rather keep off the record. While the paper features a RCMP report for such matters, when more of an investigative approach is called for, Bushman loses sleep. “It’s not like in the bigger cities where you can’t put a face to the name,” he says. You see the people in your articles walking to the post office, he says. One gruesome story that went national in June 2018 involved his second cousin, Brad Schroeder, from nearby Lanigan. Schroeder saved his wife while she was being mauled by a bear at Bethel Gospel camp in northern Saskatchewan. Her leg required 34 staples to keep the wounds closed. Bushman says the Schroeders were disappointed with some of the mainstream media’s coverage of the story, where, Bushman says, “details were not quite jiving,” such as who was attacked first and how many times. The couple was also displeased that some media seemed to overlook the role faith played, what they felt kept them alive throughout the ordeal. In both the Lanigan Advisor – a paper he purchased in 2015 – and the Watrous Manitou, Bushman dedicated both the front and back page to the story. It’s difficult to hide anything in Watrous, where grid-like streets blur into the horizon. In ten minutes, says Bushman, you can walk from one side of town to the other. A cornflower blue sky of biblical dimensions backdrops everything. Bushman poses in front of his office. Drivers of pickup trucks slow down, craning their necks to watch as the camera clicks.